When we were in Los Angeles this past February the RainyDayLA office arranged for us to attend a talk by some enterprising folks who, as they say themselves, happened onto a business. 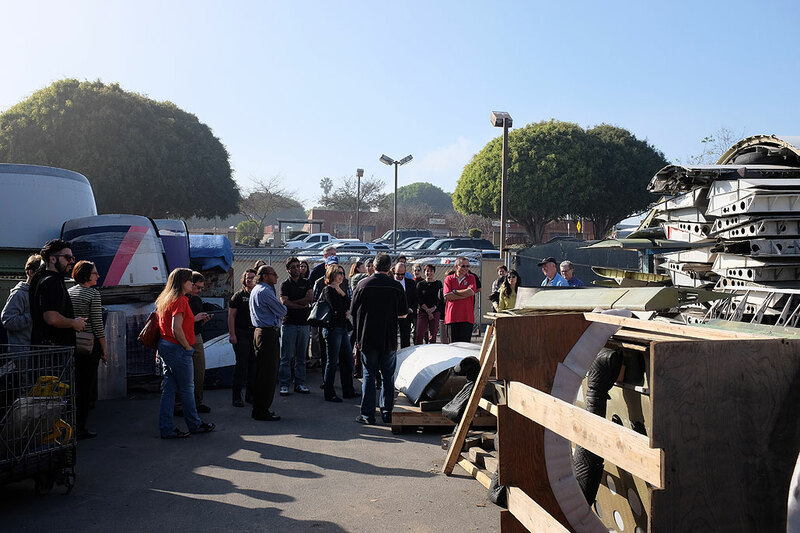 This business of theirs started when one of the partners noticed an airplane propeller on the flatbed truck of a scrap metal dealer. He bought it for a hundred bucks, polished it up, and resold it for a thousand at a local flea market; and thus MotoArt was born. 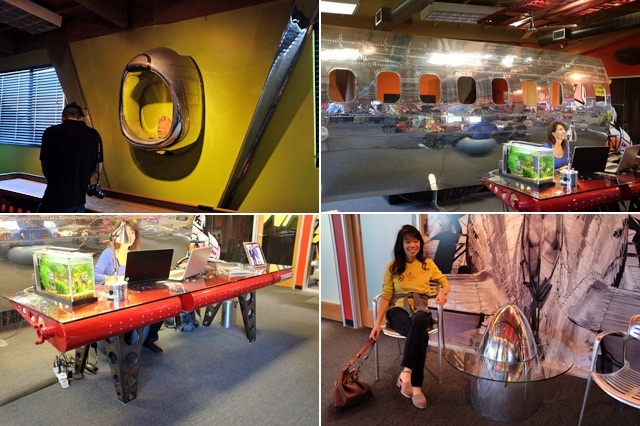 Fifteen years later, the idea has blossomed into a high end artisan business that designs conference room tables, room dividers, and other working sculptures for clients all over the world. 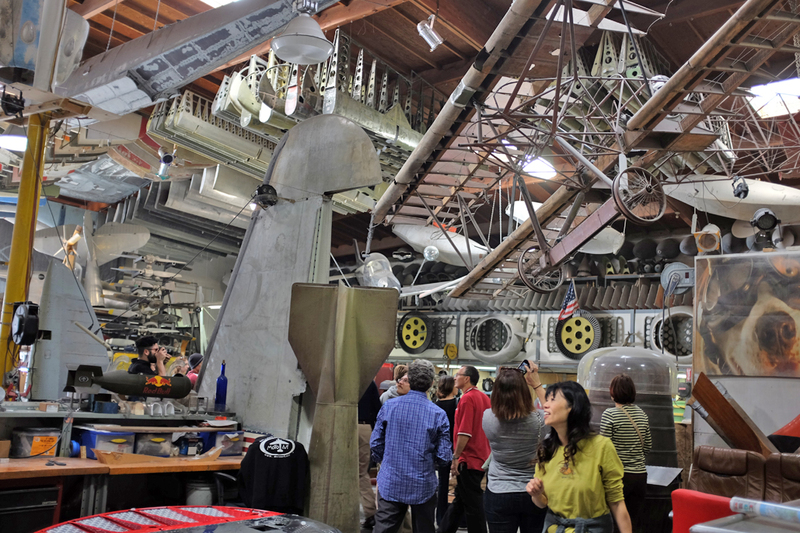 We not only got a guided tour of the showroom (where almost all the furnishings were made from reclaimed airplane parts) but a behind-the-scenes look of the workshop and “bone yard” where the magic happens. Absolutely fascinating. Interestingly, neither of the owners knew anything about aviation nor were artisans when they started out, but they are now expert craftsmen and quite knowledgeable about airplanes. All of their salvage methods and refinishing techniques were developed by trial and error. As an example of their we’ll-learn-as-we-go process, they used to cover the highly polished aluminum surfaces with a sealant to prevent oxidation, but realized that not coating them makes maintenance much simpler for the owner. The size of the pieces had a sculptural quality all by themselves, but MotoArt made them into functional objects as well. Pieces that had a flat surface were perfect for coffee tables and desks. Body panels made excellent room dividers, shelves, and doors. 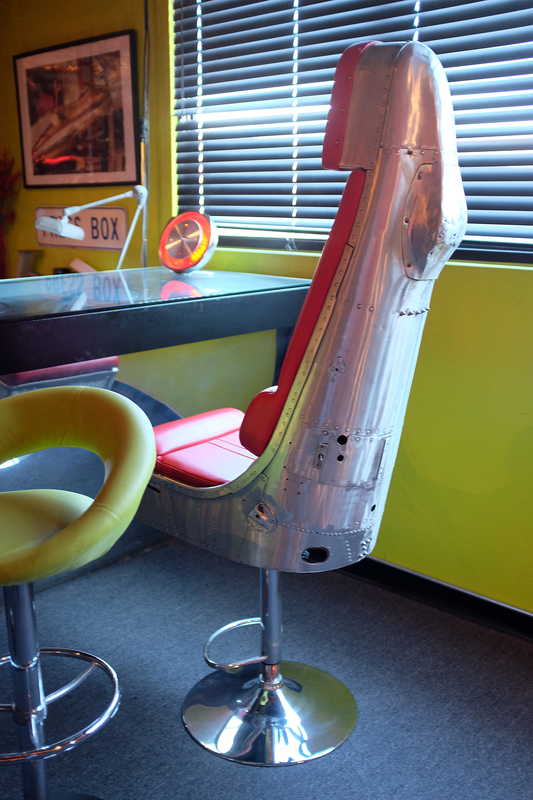 Ejection seats from fighter planes were naturals as executive chairs AND bar stools. Bold, whimsical, and nostalgic…a mix that is not often found or successfully balanced. Well done, MotoArt. The walk through the workshop was incredible. There were pieces in various stages of completion. Some items had just started being stripped, other were being sand-blasted, painted or mirror-polished. It is here where one gets a small appreciation of the large amount of effort that goes into bringing one of the pieces to completion. The “bone yard” out back was piled high with dismembered sections of wings, fuselage, and miscellaneous aircraft parts. While it was well organized, even they admitted that it was getting a bit “Sanford & Sons” back there. Who can blame them? They have to take what’s available when it’s available; they figure out what to make out of it later. 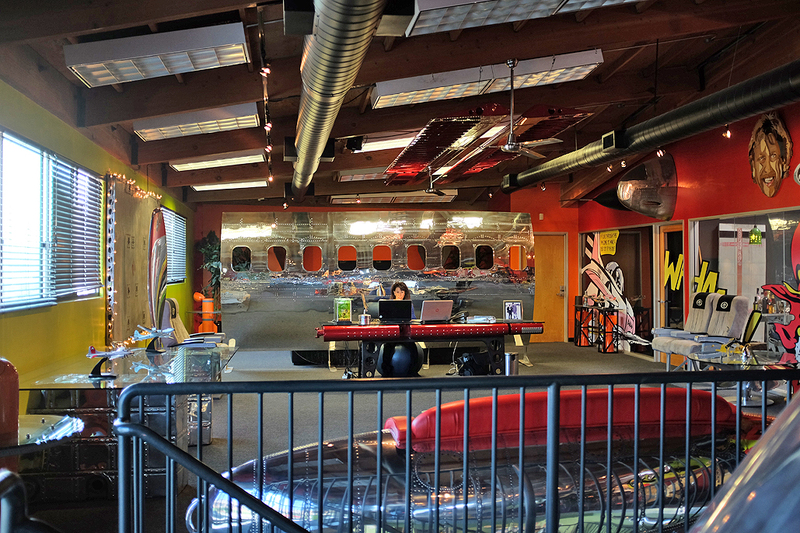 If you are in L.A., we highly recommend dropping by MotoArt. You might not get a guided tour of the workshop, but just looking around the showroom will be well worth the trip. BTW, those in Boston with a taste for aviation may want to check out the Museum Of Science’s latest IMAX film “Airplanes: A World in Flight.” The film showcases the profound ways in which aviation has transformed our lives, connected countries and cultures, and expanded horizons and minds. Featuring breathtaking visuals, the film renews our appreciation for one of the most extraordinary and awe-inspiring aspects of the modern world.